MEET GOAL To serve athletes in USA swimming in their progress to the next level in their swimming development. This "No Faster Than" Championship meet rewards swimmers for their hard work in attaining their personal goals of becoming higher quality athletes. IMPORTANT NOTATIONS This meet is not a qualifying meet for Tom Dolan Invitational but is a Championship meet for athletes slower than the Tom Dolan Invitational time standards. In the event the meet is oversubscribed, entries will be returned to teams that submitted their entries last. ELIGIBILITY Open to all USA Swimming registered athletes. Teams outside the LSC should contact the head meet director for a formal invitation to compete in this meet. Upon receiving an invitation all entries from that club will be accepted. Athletes shall compete at the age attained on the first day of the meet. An athlete may only compete in his or her own age division. 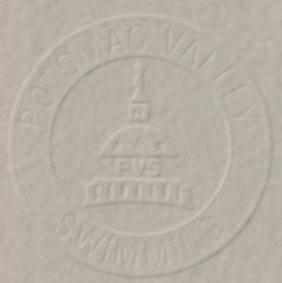 WARM-UP The prescribed Potomac Valley Swimming warm-up procedures and safety policies for Open warm-ups will be followed. AWARDS Individual Awards: Medals will be awarded to first - eighth place finishers. TIMERS Participating Clubs are required to provide timers in proportion to their entries. The Deck Meet Director will determine the number of timers per club and lane assignments. The Host Club is required to provide one timer per lane. All certified officials wishing to volunteer to work this meet please contact the MSSC Officials Contact, Chris Huott at 240-417-5569 or email huott@msscswimming.com prior to November 20. Please include your club affiliation, certifications held, and sessions you wish to work. Officials assigned to this meet should sign in at the recording table at the start of the Warm-up. Certified officials who have not been contacted, should volunteer their services to the Referee. SUPERVISION Coaches are responsible for the conduct of their swimmers and for cleaning up their team areas. ADMISSION There is no admission charge. Programs for each session will be available for $2.00 each. Working officials and coaches receive a free program. FEES Fees for individual events are $5.00. Remit one check to cover the entry fees for the entire team. Do not send cash. Telephone entries will not be accepted. ENTRIES Club entries will be accepted by email. Submission of entries by email must include the following files: the Hy-Tek Commlink II file, The Team Manager Meet Entry Report files (one by SWIMMER and one by EVENT) and an "Entry Cover Sheet." The name and phone number of the Club representative submitting the email must be included. INDIVIDUAL OR UNATTACHED ENTRIES WILL ONLY BE ACCEPTED BY delivery to the addresses shown below and will not be accepted by e-mail, unless those swimmers are training with a club and that club is submitting their entries in the required above Hy-Tek format. Clubs submitting by email may submit entries to entries@msscswimming.com, in the subject heading type, "CHRISTMAS CHAMPIONSHIPS 2007 - ****" with the club's initials substituted in place of the asterisks. Optional: Before preparing your entries, events for this meet can be downloaded and then imported into team manager. (download "21m120107.zip" now posted), unzip it and then go to team manager/file/import/meet events). To download as a file, you may need in Netscape to right click on the mouse and select "Save Link as" and with Microsoft Explorer right click on the mouse and select "Save Target As"
Manual entries must be submitted on the PVS master entry sheet. Signature and phone number of a club official must be included with entry for validation of entries. There will be a $1.00 surcharge per athlete for manual entries of 10 or more. WARNING Any Club that enters an unregistered athlete, falsifies an entry in any way, or permits an unregistered coach to represent them, will be fined the sum of $100.00 and no further entries will be accepted from that Club until the said fine has been paid. DEADLINE The Meet Director must receive all entries for this meet NO LATER THAN 5:00 P.M., TUESDAY, November 20, 2007. Important: The above date is the deadline for clubs to submit their entries to the Meet Director. Therefore, clubs usually set an earlier deadline to receive entries from their swimmers. Check with your club for this information. Fed-Ex and Other non-US Mail deliveries should contact the Meet Director. Events 200 yards or shorter may require positive check-in. Events 400 yards or more will require positive check-in.